Surrender is the divine art of letting go - the ability to flow instead of clenching, obsessing and over-controlling. According to Dr Judith Orloff, the art of letting go is the secret key to manifesting power and success in all areas of life, including work, relationships, sexuality, radiant ageing and health and healing. Once embraced, surrendering removes roadblocks and the exhaustion that comes from 'trying too hard' - and it helps you achieve goals more effortlessly and brings ongoing happiness. 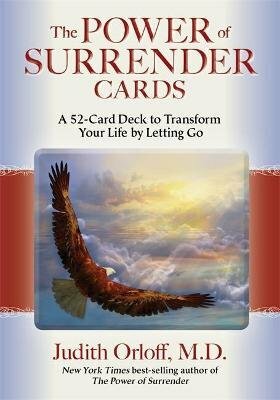 This 52-card deck serves as an oracle to empower your choices and relationships. By consulting this deck and accompanying instruction booklet, you'll be able to create the most positive future possible and learn not to sabbotage yourself. These cards are alive with magic and spirit. Use them as your personal companions to help deepen your connection to your intuition and the divine!